The advent of draperies was brought about through necessity. Many centuries ago, buildings were made with open spaces for doors and windows. The addition of draperies across these openings kept the elements out and provided privacy within. Most, of course, were made from very heavy textiles. With the advent of window glass and hinged doors, function was less important and draperies slowly became more about fashion. Like draperies, drapery hardware has gone through an evolution from strictly functional to fashionable, as well. White utility rods, whether stationary or traverse, are still obtainable and used in many homes today. Homeowners, however, need not settle for function alone. Decorative rods come in wood or metal and may be sleekly smooth or fluted (ridged) and vary in diameter from 1” to 3”. They typically come in 4, 6, 8 and 12 foot lengths and can be combined to accommodate larger windows. For a finished look, each pole can be fitted with end caps or a variety of finials. Hardware color choices may change from time to time based on current trends, but most come in black, white, silver or gold. There are lots of decorative rods available that marry utility with fashion. Draperies can be made to shirr on a rod, hang from drapery rings, or suspended from a rod threaded through the panels’ grommets. Drapery panels that are opened and closed each day work best when hung from a traverse rod. 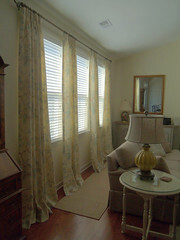 If that isn’t the look you want, we encourage customers to use a wand on their draperies’ leading edge. There is less tugging and pulling on the fabric and less chance of soiling them. Kirsch is the leading maker of drapery hardware and offers a variety of hardware solutions. In addition, there are many hardware suppliers that provide collections for a specific fashion look; i.e. contemporary, old world (European), or bamboo (island). Remember, you don’t have to choose fashion or function – you can have both!